Pull the lever to start. 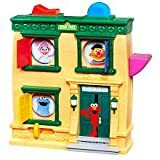 Elmo will ask who?s behind the windows. After finding Elmo?s friends, close the windows and pull the lever to make Elmo?s friends hide all over again! Elmo?s friends are hiding! And now preschoolers can help him find them. Pull the lever to start. Elmo will ask who?s behind the windows. This toy is a little different from the run-of-the-mill toy where you press a button or move a lever to get something to pop out. A couple reasons this is different: 1) there is an added feature where you press down the pink lever on the side so that the characters get mixed up and sent to different windows. the also spin around in circles which is fun for the baby/kid to see when the windows are open. 2) elmo asks you to try to find certain characters so that is a fun “challenge.” the characters themselves also talk (say hello, goodbye, tootaloo, etc). Very cute and really not overly annoying. I really like this toy… the only thing I don’t like is the angle that the baby/kid has to hold it in order to play it. it is a flat toy but it has to be held at a 45 degree angle for play. sort of hard for a baby to hold it at that angle and press the buttons and move the levers etc at the same time. really need help from an adult. my 3 yo can do it fine, but my 14 month old can’t. Very cute, bought this for my 2 year old nephew, when it arrived in the mail my 5 year old daughter could not keep her hands off of it.